The United States was founded on the separation of church and state. My husband believes nearly as strongly in the separation of toothbrush and hairbrush. You should see how he cringes every time he looks in my drawer to see the two co-habitating. It's this quirkiness that keeps me on my toes and makes Edgar such an interesting character...one I'm happy to welcome aboard! Yes, that's right. The new year is bringing big changes...not the least of which is a new voice at 'an open [sketch]book'! Edgar and I are going to need to work as a team more than ever with two little ones on the way and the practice starts here. We've carried over some of Edgar's past posts from his old blog to get you acquainted, so read away here! Welcome E! I have to agree with Edward on this one. 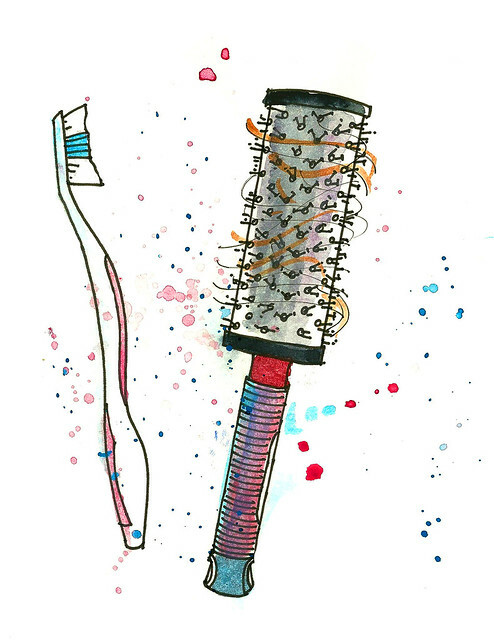 Toothbrushes & brushes should never co-habitate. :) As for the new collaboration - welcome Edward! I'm looking forward to getting to know you! Aw this is such a great idea! I love both of yall's work so I cant wait to see it altogether! What fun and fantastic news! Loved Edgar's post yesterday --- welcome! well, ummm, i think edgar wins this issue and you are the one with the brush quirk, which by default, makes you an interesting character ;). hola edgar! I am voting for Edgar on this one. teeth and hair don't go together!! Thank you all for your support on this one! I feel like a winner!